Raffaello Sanzio da Urbino, otherwise known as the famous Raphael, a master Italian painter with works displayed on the walls and ceilings of the Vatican, is the inspiration for the Sanzio line of 100% pewter doorbells, door handles, cabinet jewelry from Vicenza Designs. 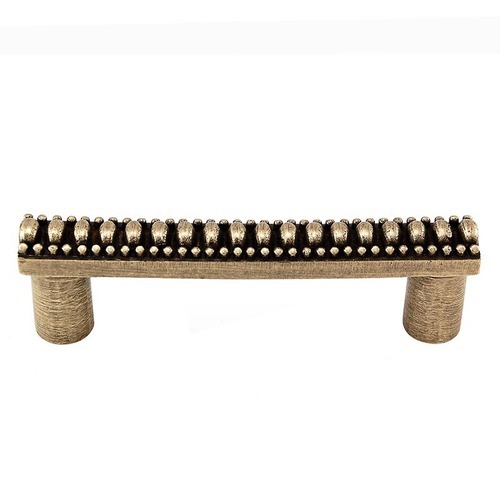 Three inch pulls are available in your choice of finish - Antique Brass, Antique Copper, Antique Gold, Antique Nickel, Antique Silver, Gunmetal, Oil-Rubbed Bronze, Polished Gold, Polished Nickel, Polished Silver, Satin Nickel and Vintage Pewter. Mounting hardware is included. 100% lead-free pewter. Handcrafted in the USA. Raffaello Sanzio da Urbino, otherwise known as the famous Raphael, a master Italian painter with works displayed on the walls and ceilings of the Vatican, is the inspiration for the Sanzio line of 100% pewter doorbells, door handles, cabinet jewelry from Vicenza Designs. Leather pulls are accented with a round pewter Sanzio design. Choose black or brown leather in 3, 4, 5 or 6 inch lengths. Available finishes include Antique Brass, Antique Copper, Antique Gold, Antique Nickel, Antique Silver, Gunmetal, Oil-Rubbed Bronze, Polished Gold, Polished Nickel, Polished Silver, Satin Nickel and Vintage Pewter. Mounting hardware is included. 100% lead free pewter. Handcrafted in the USA.